For a few years, it felt like all of humanity had rediscovered that children’s books mattered again once Harry Potter made his appearance. We all sprang forth into adulthood, mastering the fine art of reading without ever having glanced at a book before. Of course, that wasn’t true and, for many of us, Seuss provided our earliest memory of a book. To the best of my recollection, my childhood bedroom contained a selection of books, dominated by leftovers from older siblings. Therefore, the output of Disney filled most of the space- movie and television show adaptations as well as short stories filled with artwork reminiscent of the cartoons. I liked it all just fine, though the Davy Crockett books confused me since I knew the same face as belonging to Daniel Boone. To this day, I can’t keep straight which did what and where the tall tales start and end. 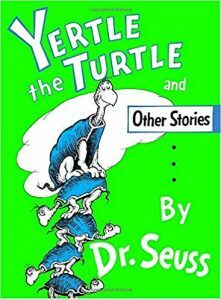 The only book that might have qualified as an early reader, however, was Seuss’ Yertle the Turtle, which I must have read incessantly. As anyone familiar with the works of Seuss knows, he did not shy away from moralizing, but many of the messages that people remember tended to be big- environmentalism and war and all those sorts of things which children just love to think about. On the other hand, Yertle, Gertrude, bear and rabbit displayed problems with which I could relate- pride, mostly. Whatever humility lingers in my generation is probably spotted in people exposed to this book at a young age. has spent a few hours reading Seuss books aloud has likely been tempted to imitate the telltale rhyme and rhythm. If you fancy yourself a writer with a knack for turning a phrase, then you may even try to create a ripoff version. Direct parodies abound and sometimes are delightful, but it is way harder than it looks. Then, consider that Geisel was happy to accept challenges like creating a book utilizing only a limited set of 250 words (Cat in the Hat). Like everyone else, I graduated to other books that have stayed with me ever since early exposure. The local library had a bench in front of picture book nooks that felt disorganized by those who had been there before me. Prize finds were always other Seuss books as well as the Curious George series by H. A. Rey and Margret Rey. Once I started on books with less or no pictures, I discovered Matt Christopher and John Christopher. I hope that I made it past the C’s in the fiction section before I was allowed into the adult stacks. Well, Donald Sobol’s books usually had their own special shelf. School and availability pushed me ahead. I read Mark Twain before anyone told me to take him seriously. I thought Tom and Huck were only meant for kids. Then, we read John Knowles’ A Separate Peace too soon in school and I was broken. In many ways, that was a significant demarcation point in my life. Whatever anyone else took away from that book, I understood that life was going to involve pain that would never resolve, though it could be mollified by reading Dr. Seuss. You’ve Got to Check This Out is a blog series about music, words, and all sorts of artistic matters. It started with an explanation. 16 more to go.